Some time ago, I collected favorite writing quotes and put them into a document to refer to now and then. This past week, I have struggled with focus in my WIP, a young adult novel called Sharing Hunter. The book is plotted, and I love the idea and characters. However, when I wrote, the story wasn’t coming together as I wanted. So I took a step back to regroup. I chatted with my husband about where I was going with the story and asked his advice about what it’s like to be a high school guy. He suggested rearranging a couple of scenes, which I think will help the story flow better. This coming week, I am committed to getting this novel into shape — the way I want it to read, the way I would want to read it. Finish editing Grace & Fire mystery novel and send to reader. Finished January 19. Write 1,500 words per week on young adult novel, Sharing Hunter. Didn’t add new words, but reworked a few scenes. Blog twice a week on Amaze-ing Words Wednesday and Deep-Fried Friday, and check-in with ROW80 updates twice a week. Posted Valentine’s Special: Candy Heart Sayings and These Boots Were Made for Shufflin’ & ROW80 on Wednesday and Have You Always Been a Writer? on Friday. Comment on at least 15 blogs per week (not counting ROW80 update comments). Tracked some comments, but not all. I probably commented on about 10 blogs. I have some catching up to do on my blog reading. Read one writing craft book. Finished On Writing by Stephen King this week. Read eight fiction books. 5 down, reading The Cat, the Lady and the Liar (a cozy mystery) by Leann Sweeney. I’ll be cheering on my fellow ROWers with their progress this week too. You can do the same by clicking HERE. So do you have favorite quotes? What words inspire you? Previous Have You Always Been a Writer? Love how you are sharing your writing experience. It helps to know that it’s not super easy for everyone to just sit down and pump out a linear story. It’s comforting. Although I realize for you, not cool. 🙂 Here’s to getting it all straightened out this week. I loved the quotes – they were so on point and helped!!! If I have a week or two like this, it’s okay. If I’m still in this confused state in 3 months, that would be uncool. Thanks, Natalie! Have a great week. Congrats on finishing Grace & Fire. What a wonderful accomplishment! You will get this wip whipped into shape, I’m certain of it. One step at a time, even if that step is backwards to better se the big picture. Ooh, I LOVE that quote, Jolyse! How wonderful. Thanks for the encouragement. Good luck on getting it all down right! The first quote makes me feel especially good about how much work we put in to our writing- although I do hope it gets a little easier with each book. Easier is relative. This is my third book, with a few other projects started and not finished. It gets frustrating when you can see the story all unfold in your brain, but you struggle to get it down on paper that way. Best wishes with the rewrites. I love YA. I’ll be checking in with you. Thanks! These quotes are great! I especially love the one by Toni Morrison. That’s one of things that got me started writing! I think my favorite is the Nora Roberts one, something on the lines of “I can fix a crappy page, I can’t fix a blank one.” Hope you’re feeling better and have a great week! That’s a great quote, Jennette! How true, how true. 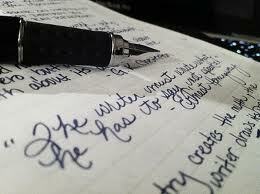 I love writing quotes too, though I don’t collect them anymore. Those are great! Those are great, Juliana! I especially like the Picasso one. Great news on finishing your mystery, Julie! Good luck on the rest of your goals. You’re going strong! Thanks for sharing those quotes! They are definitely inspiring. And I totally understand about revamping the book. It’s very cool your hubby was able to help out with that. Mine’s supportive, but he’s totally clueless. And congrats on the mystery. Good luck this week! Ha! Usually my hubby’s not that helpful with my books (though supportive too), but when I asked a direct question about teenage guyhood, it was enlightening. Thanks, Stacy! I hate when the story won’t ‘come together’ on the paper. But you’ve got the right attitude! Just take a step back, breathe, and talk it round and round with someone until your ‘aha!’ moment. It’s coming. Best of luck this week with this! It can feel like that, Nadja, can’t it? I love the idea of having an “aha” moment! Thanks. All in all you have achieved a lot this week, so don’t be so hard on yourself –there’s lots you have accomplished, focus on them and tackle each day as it comes. Keep up the good work. Thanks so much. I try to plot but be willing to veer from it if need be.